The Threaded Lane: Happy New Year! Our tree comes down today--we'll miss it! Your evening sounds similar to ours except fireworks kept waking us up from around 10:00 pm until around 2:00 am. We’re going out to breakfast and them will have a quiet day in, just the two of us. Your shrimp looks delicious. I love shrimp cooked in almost any way. Our tree will be up until the end of the week as we’re having our Bible study group’s annual Christmas party on Thursday evening. I’m ready for it to come down now though. In the past I always had everything “back to normal” by New Year’s Day because I wanted to start the year with a clean house. I hope you enjoy your day and Happy New Year. Happy New Year to you, Fletch and Tyg! I hope it is the very BEST year for you! BBQ shrimp is a favorite here too. Our New Years are always quiet. Your shrimp looks delicious - I made steak and thought it would go great with some shrimp! Happy 2019! Sounds like you ended 2018 in the perfect way. I am all about being in bed and rested to start off the New Year. Great word Vera! Same kind of day here...thank goodness I was dragged out the door for that walk first thing! Usually I keep decorations up until mid-January, but my have come down already. 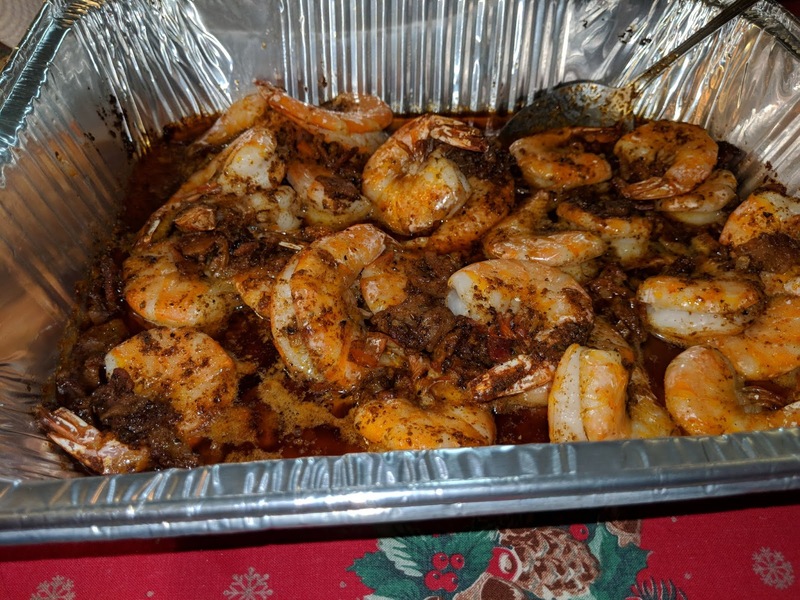 The shrimp look delish! Your holiday sounds pretty perfect to me. Your cajun shrimp looks delicious! We lived in Lafayette, Louisiana for 5 years and I really loved the food there. Here's to a wonderful new year for us all. Excellent word choice! And, those shrimp look yummy! Your word is inspiring ... and whoa, that shrimp looks delicious! Happy New Year!! I'm tempted to take down our tree before one of my helpers heads out of the country! Maybe over the weekend... though I might just have her help me remove the ornaments and actually leave the tree up. I love the light! Strengthis a great word. So many ways for it to show up in your life! Happy new year and I hope you get all the strength you need in 2019!